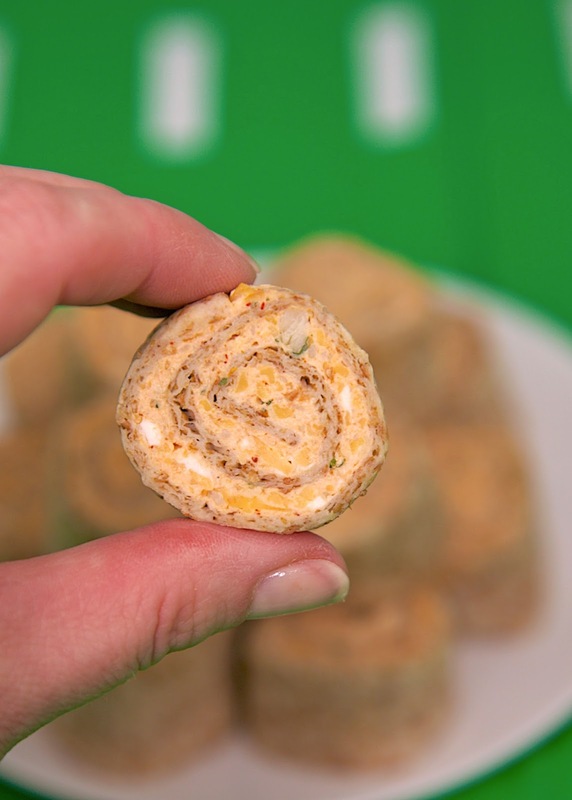 Chicken Salsa Rollups - LOVE these easy tortilla sandwich pinwheels! Chicken, cream cheese, salsa and cheddar cheese wrapped in tortillas and cut into slices. Can make ahead and refrigerate until ready to serve. 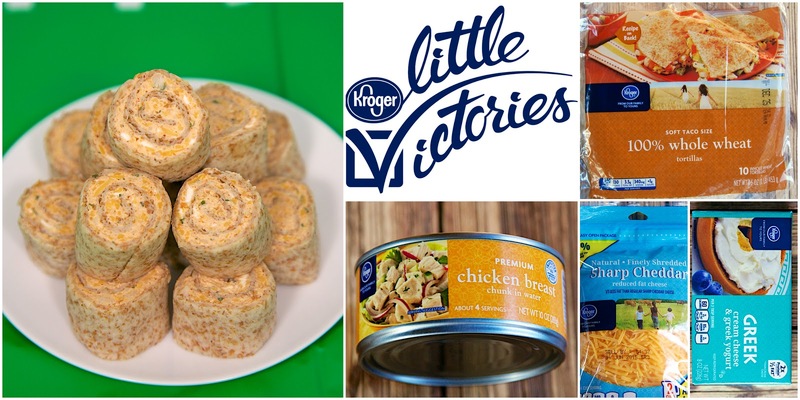 Great for parties or an easy lunch or dinner! College football crowned their first champion with the new playoff system this week. We watched the game in Vegas. It was my Christmas gift to Chicken Legs. He was in heaven! He would go every month if we could afford it. This weekend, we are watching NFL Playoff games at home. I plan on serving these Chicken Salsa Rollups. I got a similar recipe from my Mom. I just added some chicken to her recipe. These were not spicy at all. The heat will totally depend on the salsa that you use in this recipe. You can still stay on track with your healthy eating goals and eat these Chicken Salsa Rollups with a few little swaps. I used 100% Whole Wheat Tortillas, Reduced-Fat Cheddar Cheese and Greek Cream Cheese in these Chicken Salsa Rollups. Chicken Legs couldn't tell the difference. I thought they were great! Combine chicken, cream cheese, cheddar cheese and salsa. Divide cream cheese between tortillas. Spread cream cheese mixture evenly over tortillas and roll up. Cover with plastic wrap and refrigerate for two hours (to set up and make it easier to slice). Cut ends off of tortillas. Slice at 3/4-inch intervals. Arrange on tray and serve. Getting all my vitamins in this morning. My wife would like these. I might have to make them for her! Wow, what a sweet give-a-way. Looks like a good snack, party of lunch meal. Thanks for all your recipes. I used to use the Philadelphia Santa Fe cooking creme to make these but of course now I cannot find anyone who sells it. All flavors of the cooking cremes were discontinued by Kraft - no one will have them! Thanks! I had read they cut back on who sold them. It makes me sad because I used them all the time and loved them. This recipe just printed for my "2015 Football tailgate food" file. Season can't get here soon enough! 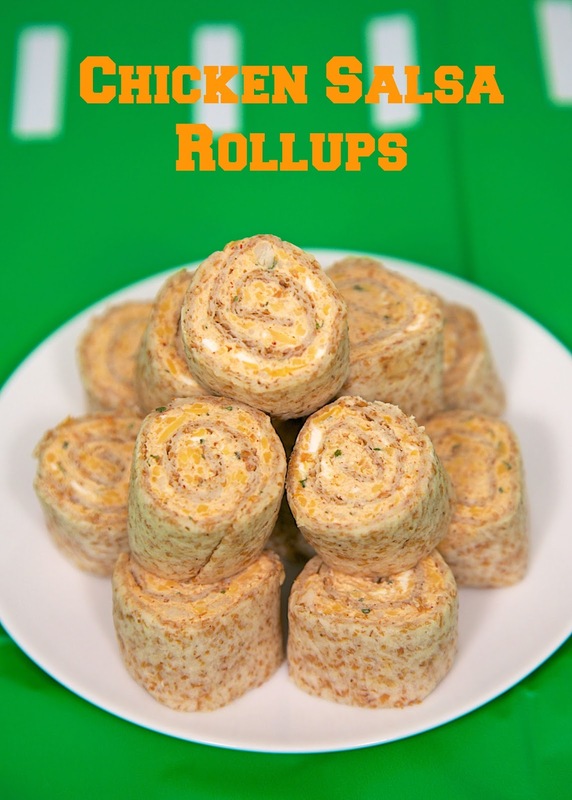 The boys will love these with guacamole and extra salsa for dipping. I can't wait to try these. They sound delicious! I really like that you shop at Kroger like myself! Making these this weekend!! Can't wait!! Greek yogurt cream cheese?! Who knew! It tastes great too! Can't tell a difference from regular cream cheese. The roll-ups look very good Steph and I can see popping them like candy. My little victory this morning was reaching for a raspberry crumb cake. Holding it for a good couple minutes, then putting it back. Yeah!!! I am so making your roll-ups, so I have something small to grab when I get the urge for a snack. I was just looking for something "mexicany", ha! My little victory this morning was eating a piece of homemade chocolate banana bread this morning that my 12 year old daughter baked by herself last night!!!! She's learning!!! My little victory was the salad I had a lunch when I really wanted a bag of chips. My victory––making it to Friday, lol. Thanks for the great giveaway! Awesome looking recipe and great giveaway thanks!! Sounds good and easy to make! My victory is walking farther today than I did yesterday! My little victory today was sticking to my fitness plan! Yay for another day! I've made roll-ups like this with roast beef slices before. This recipe using chicken will be my next endeavor. My little victory today was finally taking that nap I meant to take on Monday. Does that count? My victory today - no chocolate! My victory for today was getting caught up on my laundry. I got up early to walk. My victory was getting seconds of veggies instead of cheesy potatoes...but I can definitely get more of these! yum! Oh, and my little victory is taking 500 steps more than I did yesterday. Trying to up it by this amount every day. Like the idea of Little Victories. My today was having a dance party with my grand daughter! These look so tasty! I will have to make these for my coworkers soon! As for a small Victory...it is early (8:40 am), so far I got out of bed early without whining and have cleaned my kitchen! Onward and upward!! These are perfect for taking to work to share!